Dr John Hemming – explorer, writer, gentleman – seems a little out of place in 2011. His world is one of Amazon expeditions, museums and relics; Oxford college days and received pronunciation. Ancient artefacts line the walls of his elegant Kensington townhouse: pots and figurines that look very breakable. Most are from Peru, he says, some thousands of years old, bought at auction in London. I'm here to interview him for Friends of the Earth's 40th anniversary, which it celebrates this year. Hemming is a supporter of the charity and my first subject – one down, 39 to go. He first visited the Amazon in 1961, aged 25, with friends Kit Lambert and Richard Mason. They had set out to survey the Iriri, then believed to be the world's longest unexplored river. "The Brazilian government authorised us to name places, so we named all the landmarks after our Brazilian girlfriends," he says. The young trio – plus three Brazilian government surveyors and five local woodsmen – spent four months mapping, cutting trails into the unknown, discovering the river and building dugout canoes when disaster struck. 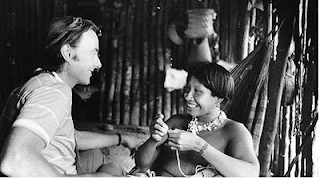 Mason was ambushed by a long range hunting party of, at that time, uncontacted Panará tribesmen ('uncontacted' refers to tribes who have had no peaceful contact with mainstream society). When Hemming and Lambert found his body, left on their trail, it was surrounded by 40 arrows and 17 clubs, his head smashed by the latter. Two arrows sit in a basket in Hemming's downstairs loo – with long bamboo stems and pointed tips, they are not much shorter than me. "It was incredibly bad luck, they were the most belligerent tribe in Brazil," he says. "They had the same word for stranger and enemy – anyone who wasn't one of them. Richard was the first to walk into the ambush – it could have been any one of us." The tribe was contacted 12 years later. The photograph above was taken a few days after first contact was made with another tribe, the Asurini. It took three years of work and several tough expeditions, he says, undertaken by Brazil's National Indian Foundation. "Meeting these indigenous people was the greatest day of my life," he says. "And she even invited me to sit in her hammock with her." Nowadays, the thinking on uncontacted tribes is somewhat different. According to charity Survival International (of which Hemming is a founder), tribes must be left alone, and effort put into protecting them. Minimal contact, such as this extraordinary, moving video, is sometimes necessary to check whether tribes have moved elsewhere, whether their lands are being invaded, and to draw attention to their existence. In the 50 years since his first trip, Hemming has travelled the entire Amazon region, documenting it in several books, including The Conquest of the Incas and, most recently, Tree of Rivers: The Story of the Amazon. He has visited and lived with over 40 tribes, four of them at the time of first contact. He now enjoys the comfortable existence of a retired explorer – "I am too old for really tough exploring" – but is still active in south America. He is off next week to Brazil for a conference of Amazonian anthroplogists, and is chairman of a new charity there that is creating a research station in an undisturbed tropical rainforest. His passion for the welfare of the Amazon rainforest remains undimmed. "It gives the world three things," he says. "It absorbs our carbon. It provides rain for much of Brazil and Argentina, even parts of the Caribbean. And it has the richest biodiversity on earth. We still haven’t documented everything. Protecting it is actually protecting humanity."